I would like to wish Selamat Hari Raya Aidilfitri to all my Muslim friends. This is indeed a month of celebrations. Whilst I am still getting my share of open houses and yummy rendang, let me share another event occurring in this month. Tonight is the Night of Sevens, a festival that is celebrated in various Eastern cultures including China, Japan, Korea and Vietnam. This celebration has its roots in the asterism of three bright stars (called the Summer Triangle) visible in the Nothern Hemisphere during the end of summer. 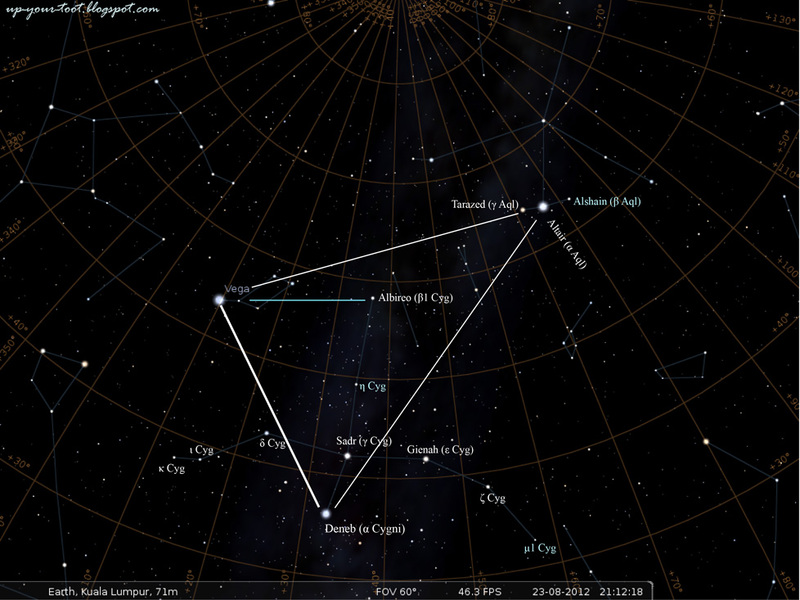 The three stars that form the triangle define the vertices of three constellations, namely Aquila, Cygnus, and Lyra, the stars being Altair, Deneb, and Vega respectively. In Chinese folklore, this asterism in the northern sky has evolved into a sad romantic tale of the Cowherd and the Weaving Maiden. Very much like the forbidden love of Romeo and Juliet, this tale features the separation of the loving couple by disapproving parents. There are many variations to this tale, but all of them have the same ending, which is a slightly happier ending when compared to that of Romeo and Juliet. In one version of the Cowherd and Weaver Girl story, the weaver girl/maiden is one of the seven daughters (some say granddaughter) of the Queen Mother of Heaven. 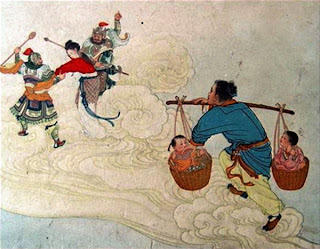 Zhi Nü (织女, literally the weaver girl) is good at weaving the sky and the colourful rainbow fabrics of heaven, thus is very well-liked by her mother. As with all young girls, the seven sisters decided one day to take an excursion to Earth, to escape the boredom of privileged life in heaven and also watchful eyes of the Queen Mother (who is depicted as somewhat an overbearing mother – like the Empress Dowager). And so on Earth, they found a beautiful pond and decided to go for a frolic in the cool water. Leaving their dresses by the bank of the pond, the girls had wonderful ‘pool party’. After a while, the girls got tired of the mortal world and when it was time to leave, all the sisters except the weaver girl could do so as her clothes had been blown away and had fallen into the hands of a passing cowherd. The kind cowherd however, returned her clothes, though we wouldn’t have a clue as to what was going on in his head, faced with a wet, naked fairy from heaven. Alas, when their eyes met, he was truly smitten and likewise, it was love at first sight for her. They decided to get married without the permission of the Queen Mother, knowing that she would forbid fiercely as he is a mere mortal and just a cowherd. Happily married, they had two children. She was a caring and hardworking wife and he was a good cowherd and worked hard in the fields. Meanwhile in Heaven, the denizens of heaven had just noticed the missing maiden when they realised that there was no one weaving the wonderful fabric of the skies. Though Zhi Nü was only gone for a day in heaven; this time was equivalent to two years on earth. Angry that Zhi Nü was neglecting her duties, The Queen Mother searched for her high and low, and finally found her on Earth, married to a mere mortal and living in a pathetic hut. Now fuming with anger, she gave the ultimatum to Zhi Nü: Come back to heaven or the cowherd and the village will be destroyed. Fearful for her husband and children’s safety, she had no choice but to leave her beloved behind. The cowherd with his two children chasing after his wife, the Weaver girl. Image taken from http://www.yholiday.com. Shocked and racked with grieve that her wife had floated away to the heavens, he was equally shocked when his old, faithful buffalo talked and advised the astonished cowherd to kill him and that his hide be used to ferry the cowherd to the sky so that he could be with his wife again. Apparently the buffalo was a heavenly officer punished by the Heavenly Emperor and was cast to Earth. With a heavy heart, the cowherd had to kill and skin his faithful buffalo and prepared himself for the journey. He placed each of his children on a basket and passed a yoke through the baskets, carrying them upon his shoulders. Flanked by a child on each side, he rose to the heavens after putting on the hide of his talking buffalo. Slowly he could see that he was getting closer and closer to his lovely wife, Zhi Nü. Just as he was about to reach the maiden, he was noticed by the still seething Queen Mother. Disgusted with the cowherd’s attempt to reach her daughter, she quickly drew a hairpin from her headdress and with the pin, proceeded to scratch the heavens, creating a silvery river that blocked the cowherd from reaching the maiden. And so the two lovers stood on the opposite banks of a deep and fast flowing celestial river, in grief. The sad cries of the maiden, and that of her loving husband and children, who were so close and yet beyond reach however, touched the hearts of the gods in heaven and all of the magpies in the world. And so every year on a late summer’s night, all the magpies would be allowed to soar up to the skies, and make a bridge across the Silver River so that the lovers would be reunited and be a happy family again for that one night. A happy family portrait for the Weaver Girl and the Cowherd. Image taken from http://forum.petalia.org/topic/36258-nguu-lang-chuc-nu/. 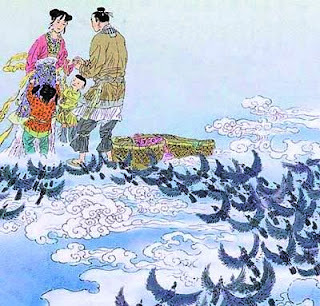 Another name for this Festival of the Night of Sevens is the Magpie Festival, after the magpies that formed a bridge (鹊桥) to bring the lovers together. The cowherd is the star Altair (α-Aquilae) on the constellation of Aquila, the maiden is the star Vega (α-Lyrae) on the constellation of Lyra and the magpies are the stars of the constellation of Cygnus (the Swan), with Deneb (α-Cygni) being the brightest and marks the position of the chaperone (a fairy or deity) who guides the formation of the bridge. The two children are Tarazed (γ-Aquilae) and Alshain (β-Aquilae), flanking the star Altair on both sides (the children carried in two baskets on a yoke). On summer’s end, the stars appear bright on the skies of the Northern Hemisphere and with the alignment; it appears as if the stars in the constellation Cygnus is bridging the Milky Way (Silver River) to bring them together. 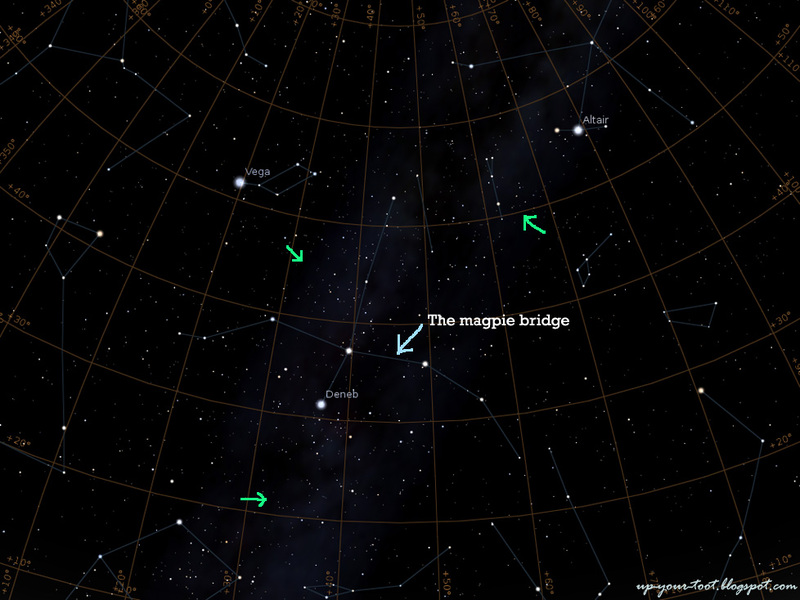 Also, the Milky Way appears dimmer at this time, hence allowing for the bridge of stars to be seen clearly. Thus, one can see how this asterism can be linked with the tale of the magpies, the self-sacrificing maiden and the cowherd with their pining children. A computer rendition of the Northeastern sky at 8.39pm on 23 August 2012 as seen from Kuala Lumpur Malaysia, with no atmosphere, no ground and azimuthal grid. The Milky Way is the fuzzy white area where the light blue line runs through. 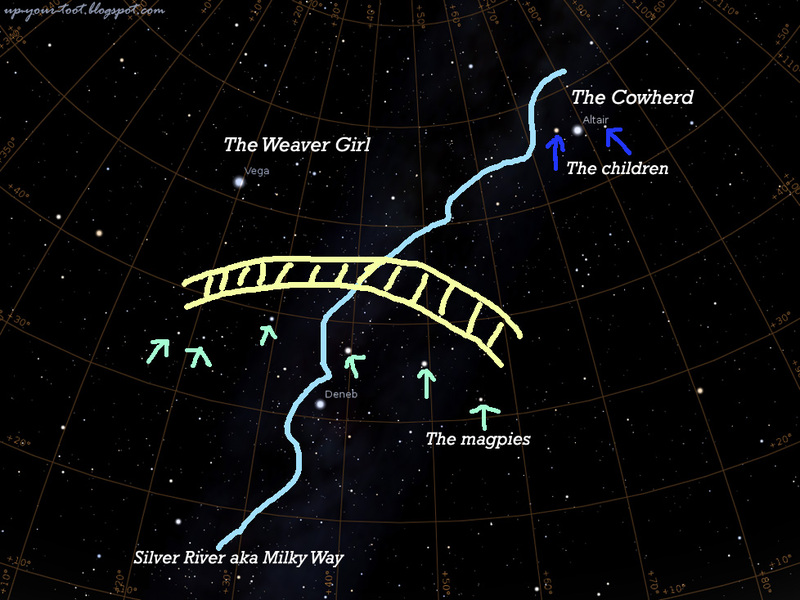 The Cowherd and his children are labeled and the stars that form the magpie bridge are marked with green arrows. 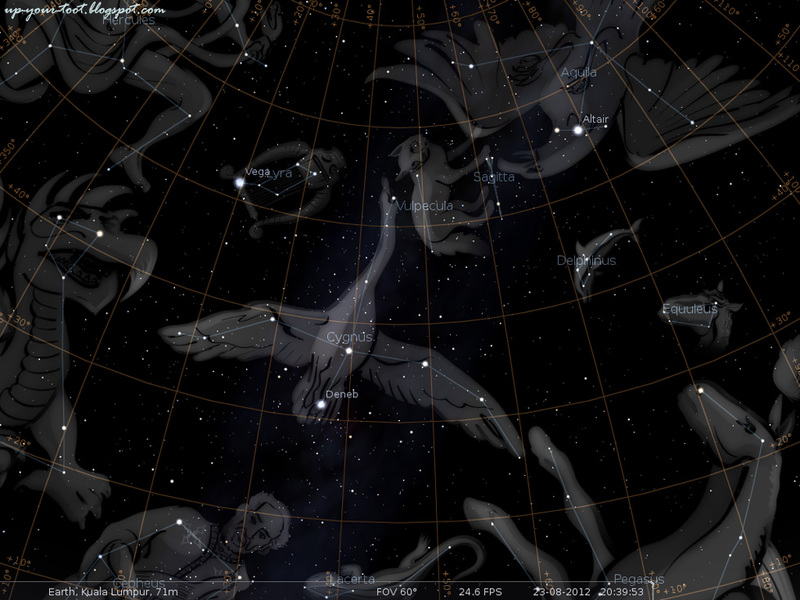 Image captured from Stellarium software. On the night of the seventh day of the seventh month in the lunisolar calendar, this double seventh night is celebrated as the Qixi Festival (七夕节). It is a day for young maidens to pray for a good husband, and to demonstrate their domestic skills, very much like the weaver maiden, in hopes of attracting a good man. Thus this festival is sometimes incorrectly referred to as the Chinese Valentine's Day. The Japanese festival of Tanabata is the equivalent to the Chinese Festival to Plead for Skills, another name for the Qixi Festival, which was adopted by the Japanese in the Heian period. Here the maiden is Orihime and the cowherd, Hikoboshi. Whether known as Qixi to the Chinese, Tanabata to the Japanese or Chilseok in Korea, this asterism of stars had become a popular folktale and a festival in its own right. We may never know if indeed the two lovers get to meet once a year or not, but hopefully all lovers out there wouldn’t have to wait once a year to be together with each other. The same image as above, but with constellation art superimposed - Vega in the constellation Lyra (the Lyre), Altair in the constellation Aquila (the Eagle), and Deneb in the constellation Cygnus (the Swan). This is what you will probably see, without clouds but with light pollution - just three dots marking the vertices of the triangle. If you want to observe the above asterism tonight (23 August 2012), the constellation Lyra, Aquila and Cygnus rises in the Northeasterly quarter in Malaysia as early as 5pm. So by 8.00pm, Deneb would be 30o above the horizon. The only obstacle to observing these stars are severe light pollution, haze and cloudy skies. So people in KL might be a bit out of luck. One can also use the free software called Stellarium to help locate the stars in the sky, or to reminisce the love story of the Weaver Maiden and the Cowherd. UPDATE: Suprisingly, the skies were clear over KL and at around 9.11pm, I could see the stars Vega, Altair, Deneb as well Albireo with no difficulty even though coming from a lighted room. The triangle can be clearly made out (marked with white lines), with Vega at the same level with Albireo (the blue line). 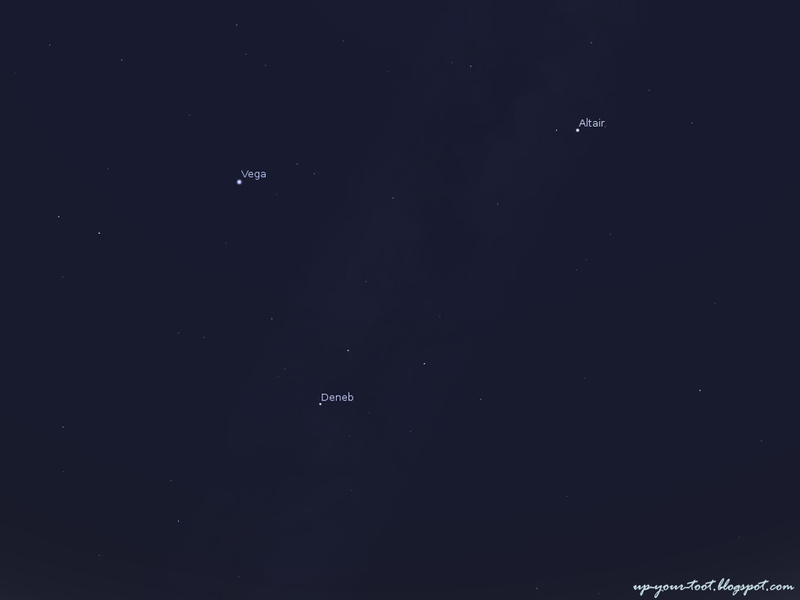 Though not a real picture of the Summer Triangle, this Stellarium image is just like what I saw tonight. The triangle formed by Vega, Altair and Deneb could be easily picked up on the sky. Then I noticed Albireo that was in line with Vega. Tarazed could also be seen beside the bright Altair. The stars that formed the Magpie Bridge was the next thing that could also be picked up with ease, with some stars (worded blue) being a little tricky to place. Finally, the star Alshain required some time and staring into the sky to catch a glimpse of. So I managed to see the entire family, magpies and all, thanks to the clear skies tonight. Other stars that required little or no acclimatisation to see are the stars in Cygnus (the Magpie bridge - kappa, iota, delta, gamma, epsilon, zeta, mu-1 Cygni, plus eta Cygni, with some that are slightly more difficult to make out at a glance) and the child, Tarazed in Aquila. The second child of the cowherd, Alshain required some acclimatisation to view and I had to stare into the darkness to see it. So there you have it, a happy family reunion, for the sky was clear and they didn't shed a tear (well, at least over here in KL). what a sad romantic story.I enjoy reading it and managed to see the family of the cowherd.Thank God for a happy reunion and an enlightening Qixi night. Sean, this is a well researched piece on your part, a story well told. I heard from my grandma that long ago it was a tradition for girls to pray to be as beautiful and skillful as weaver girl and for the guys to pray for a wife as "magical" as weaver girl. They also hope for a marriage that 'live happily ever after'. The love between Weaver Girl and Cowherd is monogamous and everlasting, one that surpass celestial boundaries. These are good values we wish to have as a loving couple. I believe that this is in the real sense, is a Chinese Valentine, just that modern Chinese celebrate the western Feb 14th instead of this day. Thanks Autumn Belle. Indeed this is the festival to plead for skills and happiness. Unfortunately the popularity of this celebration with the local Chinese community is rather weak, unlike in Taiwan or Hong Kong.